Just in time for Ixi Day, we are wandering through the alphabet and discovering everything there is to know between A and Z about the wonderful Ixi. Let`s dive right in! Not counting the default Ixi avatar, there are six avatars featuring this species. They feature famous Ixi such as Nabile, Tarla, Sinsi and Sophie the Swamp Witch, as well as a Faerie Ixi and a Disco one. Every Neopets deserves to have a bit of time in the spotlight, and that can get difficult with how many species there are, but the Neopian calendar has made room so that each pet has their own special day. On these special days, new wearables are released, new colors become available, and all the creative minds around Neopia put their best writing and art skills to work to create content around their passion for that pet. That's why I'm here! Dive into the Month of Swimming! Neopia offers new and exciting experiences in its hidden underwater worlds. 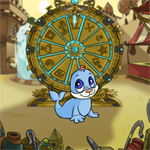 Why not explore beyond what is seen by the average Neopet? Try snorkeling or diving in Neopia’s top five sites – this article tells you where to go and what to look for! Always remember to consider your safety when swimming in open water – always tell a parent or friend where you are going, and if you are diving make sure to dive with a buddy so you can help each other if needed. Like usual, a blizzard was sweeping across the peak of Terror Mountain. Pellets of snow and ice battered the frozen ground as powerful winds swirled heaps of snow through the air. Anyone with a lick of common sense would be huddled indoors during a storm like this. However, a lone Mynci was struggling his way through the terrible storm. He had been trying to reach the entrance to the Ice Caves, but lost his way when the storm arose. Unable to see two feet in front of him, ice was encrusted on his fur, and fluid that dripped from his nose and eyes froze instantly. His lips were chapped from the cold wind, and his breathing was shallow. “Where's that Snow Faerie when you need her most?” the Mynci's rattled brain thought, citing the helpful guardian of those lost on Terror Mountain. Aching, lethargic, and miserable, the Mynci pushed onward with no idea of where he was going. Winds threatened to shove him into the ground, and he practically waded through increasingly deep snow. He knew for sure that he would desperately have to find some shelter for the night. Either exhaustion, cold, or something else finally came to him, for the Mynci began to teeter on his feet. His vision was flickering with strange colors and his head was muddled with thick fog. The Mynci let out a soft groan as he collapsed in the snow. The last thing he heard before his consciousness went was the shuffling of huge feet. As the Mynci had struggled through the storm, unbeknownst to him, he was being watched. A creature, covered in thick white fur, nearly invisible in the blizzard, had been following the Mynci throughout his treacherous journey. The creature stood nearly eight feet in height, was built powerfully, and bore curved horns on its head. It traveled through the snow on two sturdy legs that ended in blue-colored paws like dinner plates. Yellow eyes with red irises, covered with thick lashes, observed the Mynci from a distance. A young shadow Korbat and darigan Mynci ran through the crowds, tripping and jostling Neopians as they rushed to the Colosseum. After running into a few Neopets and earning some angry shouts, the two friends skidded to a stop as they stared at the monstrous line of people in front of them. The Mynci whistled. “You’ll never get a ticket with this huge line, Lysander.” The Korbat, Lysander, groaned. “I should have gotten a ticket to the Colosseum early, like you, Silas.” “You’d better get in line if you want even a chance of getting a ticket.” Silas chuckled. “I’ll catch ya later, once you’re out of this line.” Lysander sighed as he watched Silas wander off. He turned to face the enormous line that he was in, which was moving forward at a sluggish pace. Hours crept by, and the sun overhead slowly tipped to the west, indicating to the Neopians below that it was early afternoon. Lysander inwardly rejoiced when it was his turn to walk up to the Gelert lady with puffy red hair. “Uh, I’d like to get an Altador Cup ticket, for entry into the Col-“ “Sorry dearie,” The Gelert interrupted. “We’re all out of tickets.” Lysander gaped at her. “How…?” He glanced at the table the Gelert was working at, and sure enough, the once-large stack of tickets had vanished. The ticket lady sighed wearily. “We’ll be restocked with more tickets in a few hours.” Lysander turned away from the Gelert lady and stared at the crowd behind him, which was glaring at him for taking so long. A few hours? I’ve already been waiting for that long! Lysander walked out of the crowd and used his wings to fly over the stone walls of Altador City. As he headed home towards the Docks, his mind raced with ideas on how to get a ticket in some other, faster, way. His thoughts were broken as he spotted his friend below in the lush farmland, running towards the walls of the City. Come Celebrate Our Birthday with New Goodies! Just in time for Ixi Day, we are wandering through the alphabet and discovering everything there is to know between A and Z about the wonderful Ixi. You tell yourself, "I am going to conquer Meerca Chase II if it's the last thing I do on neo," and you sit down on your couch with a cup of water and your imaginary headband and you're ready to conquer it. I’m here to bring you an article about my Top 12 Favorite Avatars For Summer! Why just twelve you ask? Well, if I named every summer themed avatar and why I loved them we would be here all night.